Answer: Who was Major Truman? From Rumsey map collection (see below). would give me much. (The words are pretty common.) So I did a quick search on Google Maps to verify that this part of the US near Lake Erie IS in fact in Ohio. Once I looked at the map, I realized that this IS a map of Ohio--just labeled with things I hadn't heard about before. ("Army Lands"? In Ohio?) I hadn't heard of Ft. St. Clair before, and I wasn't sure if "Cincinata" was the same as "Cincinnati" or not. But once I saw the map, it was clear. 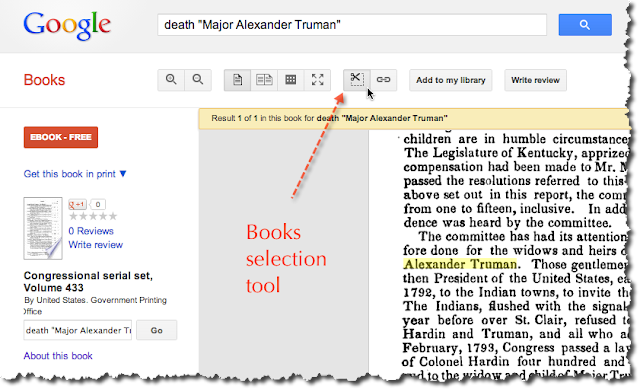 Somewhat to my surprise, the Slate article had a link to the Google Books scan of the Congressional Serial Set #433 (1844) which has the story of Major Truman. His company left to make peace with the local Indian groups. But the negotiations didn't go well, and Truman (and his group) were killed. "...the widow and child of Major Truman three hundred dollars per year for a like time [ 7 years ] ... "
Or, $2100. But then Congress acted to extend $100 / year to the children of Truman and Hardin until they became 21. We know how much the Hardin children received, but it wasn't known how much Truman's child received. While looking for background information, I was trying to understand what Truman (Trueman) and Hardin's (aka "Harding") mission was all about. I was pointed to the Wikipedia entry about the Northwest Indian War (a topic about which I admit to knowing nothing), a war that is also known as the "Old Northwest Indian War", the "Ohio War", the "Ohio Indian War", and the "War for the Ohio River Boundary." In U.S. Army records, it is known as the "Miami Campaign." (See footnote 1 below.) So even the simplest searches quickly get complicated. That same search led me to the FindAGrave site for Truman, which tells us that he was killed near the town of Ottawa, Putnam County, Ohio. That's certainly consistent with everything else we've learned, so I suspect his last stand was somewhere there. This search also led me to the RootsWebAncestry site for Alexander Truman. But by following up a note I saw there ("... See American State papers, Indian affairs, volume 1, page 243.") I was able to locate the original story of the ill-fated mission. (A link to the high-quality TIFF image of that page from the LOC American State Papers. The site link is here.) It's a sad story. He was killed, then scalped. His scalp was then later recognized by a passenger on a boat going upriver (and confirmed by the man with the scalps he held "...on a small stick..."). From American State Papers: Indian Affairs, Volume 1, p 243. 1. Who was Major Truman? Can you find out where (closest current city name) he was killed? And why was he killed here? We figured out much of this already: He was sent out by President Washington to offer a peace treaty to the Indians in that part of Ohio (the Miami tribe). He was apparently killed near Ottawa, in central Ohio, while conducting negotiations. His family was paid at least $2100 ($300/year for seven years) PLUS $100 / year until his daughter turned 21 years of age. 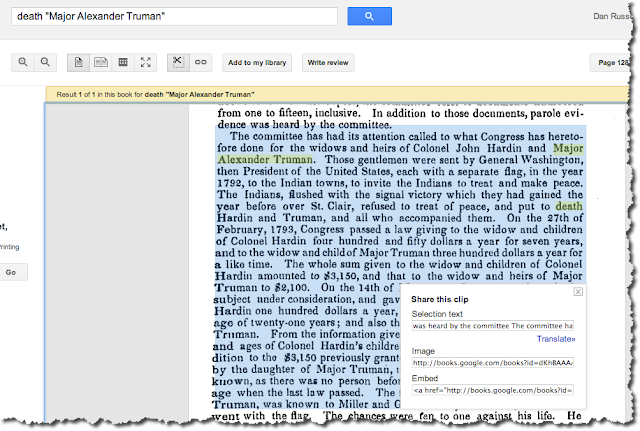 he found this page in The Papers of Alexander Hamilton gives the expense for supporting Truman's children at $300 / year. "That can be interpreted that he had 3 children not one being paid $100 per year." B. Rosemary wisely points out that when you're in Google Books you can copy out the TEXT of the book by using the Selection widget in the top part of the book view. Once you've selected the tool, you can sweep out a region of the text (yes, it's an image, but there's text underneath it). 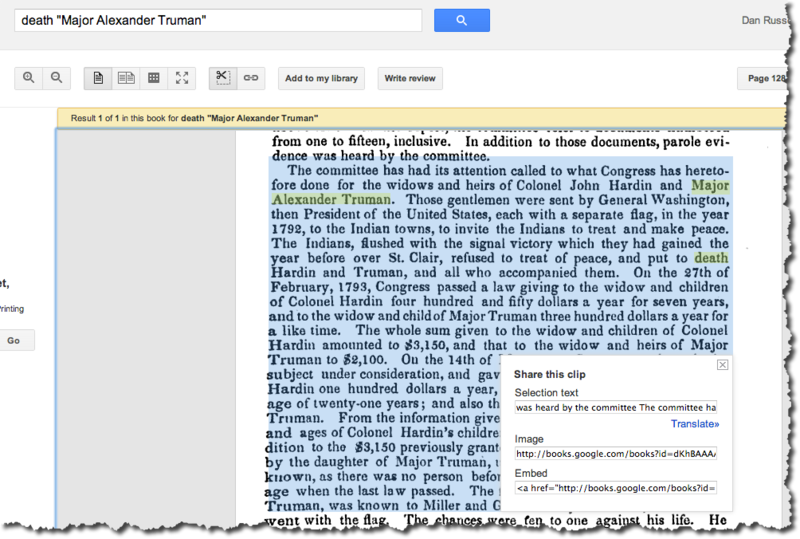 Here I've highlighted the section about Major Truman and the law passing benefits to his family. You can now copy this as either text (in the "Selection text" region) or as an image (Books gives you a URL to the image) OR as an embeddable text widget. "The committee has had its attention called to what Congress has heretofore done for the widows and heirs of Colonel John Hardin and Major Alexander Truman Those gentlemen were sent by General Washington then President of the United States each with a separate flag in the year 1792 to the Indian towns to invite the Indians to treat and make peace The Indians flushed with the signal victory which they had gained the year before over St Clair refused to treat of peace and put to death Hardin and Truman and all who accompanied them On the 27th of February 1793 Congress passed a law giving to the widow and children of Colonel Hardin four hundred and fifty dollars a year for seven years and to the widow and child of Major Truman three hundred dollars a year for a like time The whole sum given to the widow and children of Colonel Hardin amounted to $3,150 and that to the widow and heirs of Major Truman to $2,100. On the 14th of May 1800 Congress again took the under consideration and gave to each of the children of Colonel Hardin one hundred dollars a year until they respectively attained the age of twenty one years and also the same sum to the daughter of Major From the information given to the committee as to the number ages of Colonel Hardin's children they received about $2,800 in addition to the $3,150 previously granted them How much was received the daughter of Major Truman under the law of 1800 could not be determined as there was no person before the committee who could state her age when the last law passed..."
Search lessons: There are a few here. 4. Remember that you can select text out of Books by using the tool. Be sure to making checking-out-the-tools part of your daily life. Be curious about what's out there--you never know what you'll find! (Note 1) After the Revolutionary War, the Americans considered the region in the northwest (that is, much of present day Ohio) theirs by conquest. Through the creation of the Northwest Territory in 1787, they began to divide the land north of the Ohio River for settlement. Native Americans living in the territory resisted and violence escalated with Native Americans forming Western Confederacy. Their goal was to keep the Ohio River as a boundary between Indian lands and the United States. 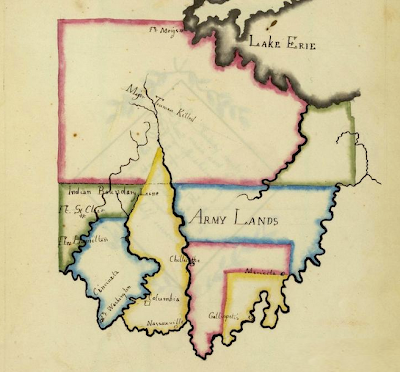 Little Turtle emerged as one of the leaders of this confederacy, which included the Shawnee under Blue Jacket and the Delaware under Buckongahelas. The war which followed has become known by historians as the Northwest Indian War, but it was also once known as "Little Turtle's War." After several battles, Little Turtle and Blue Jacket defeated another American expedition in 1791 led by General Arthur St. Clair. It was the worst defeat the Americans would ever suffer at the hands of American Indians, with some 600 American soldiers killed in action. While Little Turtle and Blue Jacket fielded more than 1,000 warriors, they lost only 40. Despite this success, the confederacy was defeated at the Battle of Fallen Timbers, forcing the Western Confederacy to sign the Treaty of Greenville. Wednesday search challenge (10/30/13): Who was Major Truman? This beautiful map came across my desk the other day when I was looking for something else. I'll let you search for it and get the backstory behind this map (it's a good story). But the first thing that crossed my mind when I saw this was "Who was Major Truman?" Or more importantly, why was Major Truman so important that his death was noted on this beautiful, but otherwise fairly empty map? Be sure to let us know HOW you found the answers! It's very short, and would be incredibly helpful! If you're like me, your online life is lived primarily in a small number of apps. For me, I run two browsers (Chrome for my work email and web-apps, Firefox for my personal stuff), each with a few windows to partition my work into logical "sets" of tabs that belong together. I also "live" in a text editor for all of my writing. There are other apps floating around, but in general, I try to keep the total number of active apps to a minimum. Say, 3. What this means is that I try to NOT have a zillion apps for every part of my online life. So while I now occasionally use Feedly as my Google Reader replacement for RSS feeds, I often forget to check it. There ARE a few blogs that I really don't want to miss. My "must read" app continues to be Gmail. I read through everything about twice / day. And email has become my "archive" of choice for interactions. It is, in effect, a personal record of my interactions with people and organizations. 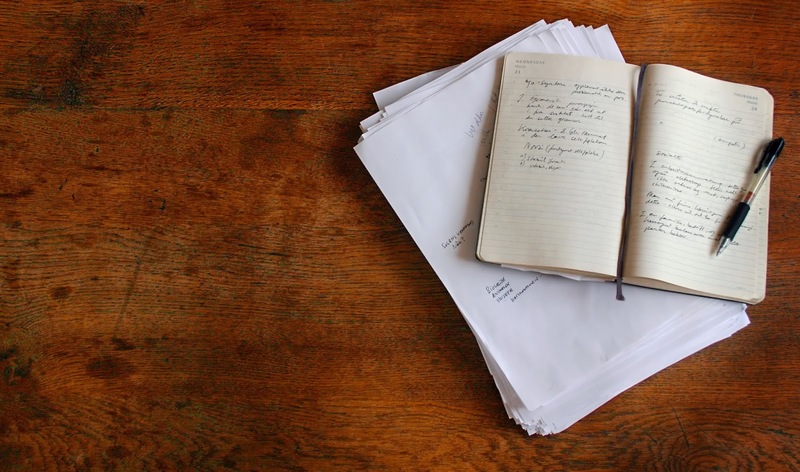 So.. how do I make sure I don't miss a single important blog update from my favorite bloggers? Easy. I'll use SearchResearch as an example. 2. Use the site: operator to scoop up everything newly published on that site. In this example, I'm going to put in site:searchresearch1.blogspot.com and have it update "as it happens" sending me "all the results." Don't be confused by the site:sites.google.com... the second "sites" is just the subdomain name of the Google "Sites" product. 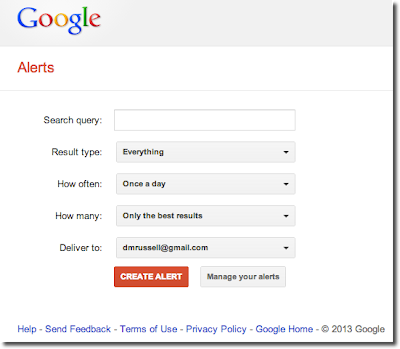 Then, to manage your Alerts, just go back to google.com/alerts and you'll see a control panel where you can adjust the search query, the frequency of updates, and delete them when you no longer are interested in tracking. Answer: Why is this tree here? THE two things that struck me about this photograph (the third one in yesterday's post), was (1) that there was another tree just like the first one just a little behind and to the right. See it? and (2) that the tree seemed to be losing all of its bark. Could that be a clue to its identity? 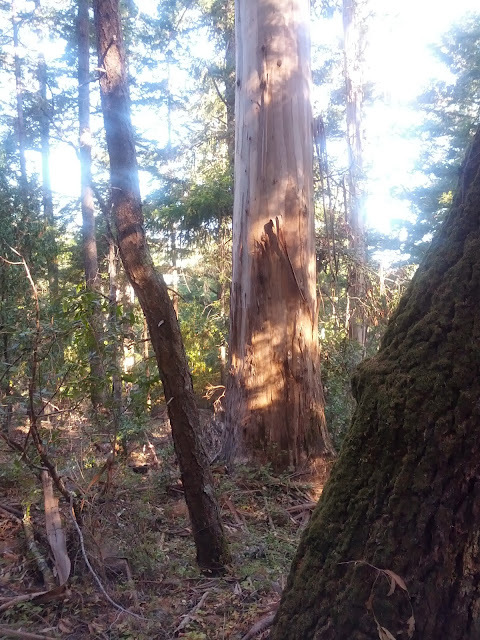 Then I switched to Images and fairly quickly found that it was either a Madrone or a Eucalyptus. A bit more poking around, and I came to the conclusion everyone else did. It's a eucalyptus. They were, as several people noted, originally imported from Australia and planted widely in California for many reasons (most of which did not pan out, although there is a good deal of controversy about this particular kind of tree). 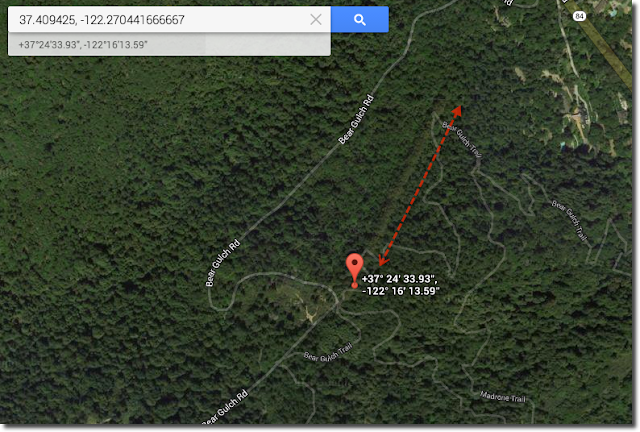 So this made me wonder not just why ONE eucalyptus was growing deep in the woods, but why there were TWO!! 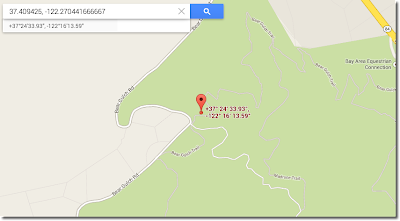 Time to switch to a Maps view and see if there's anything else going on. Like most of you, I dropped the lat/long (37.409425, -122.270441666667) into Maps, and was able to identify this as being in Wunderlich County Park. That's a useful clue in understanding the history of the place, but I was curious about what an aerial image would look like. Look what I found by changing the KIND of Maps view! Intrigued by this, I zoomed out a bit more and found even MORE long lines of eucalyptus trees in the immediate neighborhood, all in the borders of the park. 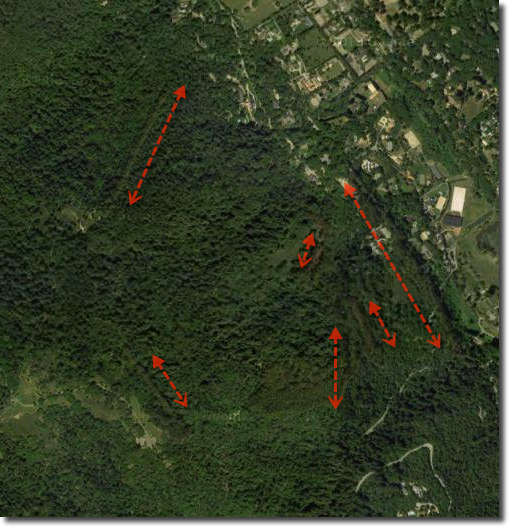 Below I've marked the lines of trees that I see. 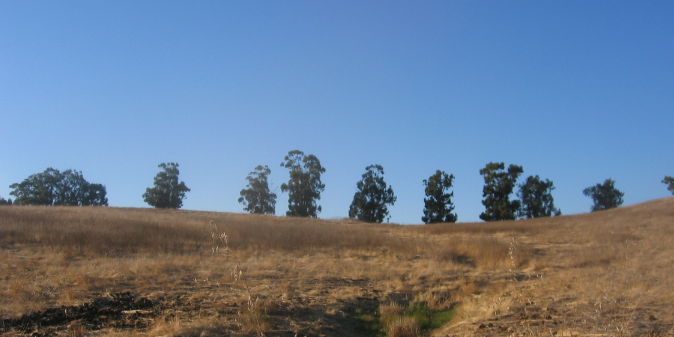 We see these trees as lines because the eucalyptus are all taller than the surrounding oaks and pines and are a slightly different shade of green. 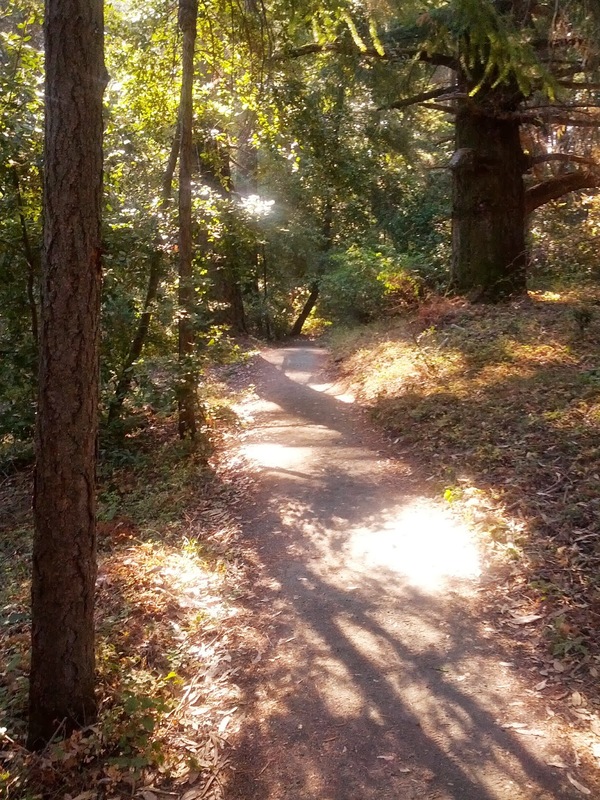 We do know (from the History page of the Friends of Huddart and Wunderlich Parks) that Wunderlich Park was originally owned by John Coppinger, who received it as part of a large (14,000 acre) land grant in the 1840s. Simon Jones purchased 1500 acres of the Coppinger land in 1872 and made many improvements (retaining walls, roads) using Chinese laborers. Many of these walls and trails are still in use roughly 150 years later. Jones died in 1890 and the property was sold to James A Folger II in 1902. Folger (he of the coffee business) transformed the land from a working farm into a recreation area. Wagon trails and old skid roads became riding and carriage trails. The contractor Martin Wunderlich bought the property from the Folger's in 1956. And in 1974 he deeded 942 acres to San Mateo County for use as park and open space, which is how this former estate became a park I could run through. Search lesson: It's sometimes incredibly useful to check other views of the same data (as I did here by looking not just at the Maps view, but also at the aerial imagery view. You never quite know what other data is there for the observation! 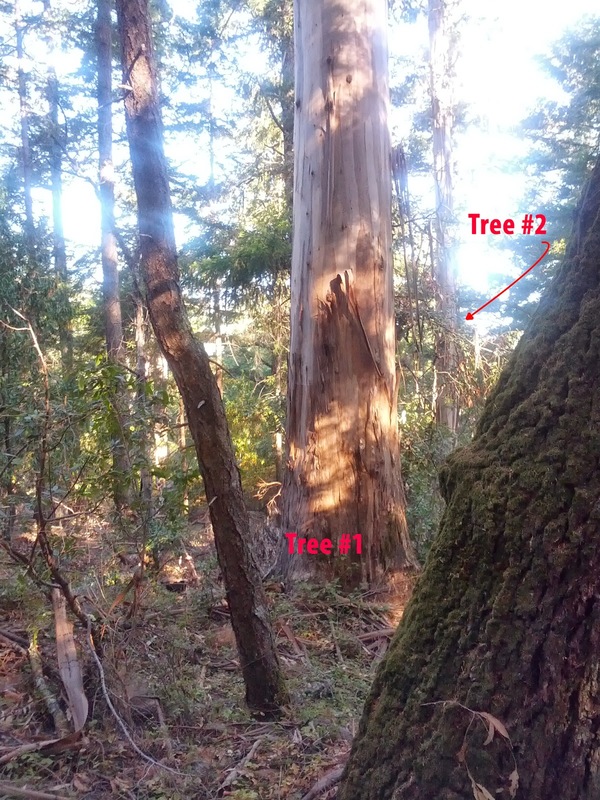 Wednesday Search Challenge (10/23/13): Why is this tree here? THE other day I was running through a local open space preserve, zipping through a mixed pine / oak woodland at a steady pace, enjoying the sunlight dappling through the trees. This is a wonderful place to run. 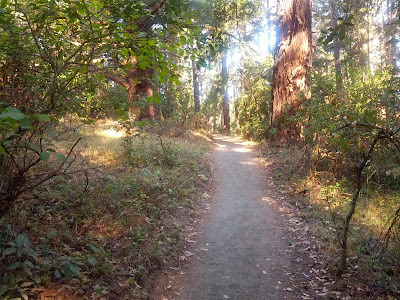 The trails go deep into the local forest that blanket the hills to the west of Silicon Valley; they pass from one kind of local ecosystem to another. 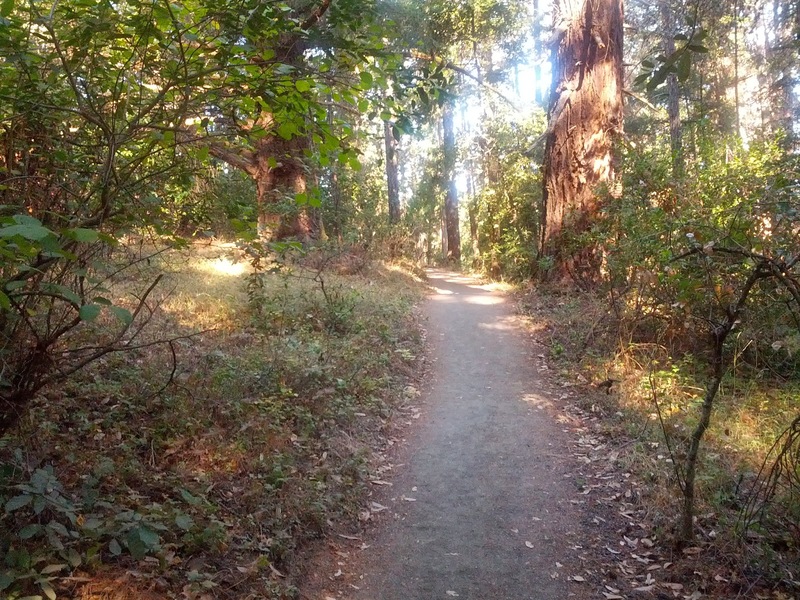 If you run here, you can expect to pass through groves of redwoods, stands of Douglas fir, live oaks, and even chaparral with manzanitas and chamise. But at one point I saw something SO unexpected that I stopped and took a couple of photographs. Here's one of those pictures. See that tree on the right? It's SO out-of-place, so unlike all of the trees around it that I literally stopped dead in my tracks to take this photos. Here's a close-up of the tree. As you can see, it's not like anything else nearby. 1. What kind of tree is that? 2. What's it doing here, deep in the forest? I know this seems like another of Dan's-impossible-questions, but I believe you can figure all of this out. It will require a bit of out-of-the-normal search thinking. What recognition-based search apps are there? When I posed the original question, what I meant to ask was "What recognition-based tools are there that we can use for search?" Here's our provisional list so far. These are all apps (or tools) you can use to recognize objects or signals in the world. I've grouped them by sensing mode (that is, how does your query device sense the signal it's going to try and recognize). When you think about it that way, all of the "image reco" apps go together (they're all variations on image processing) and all of the "audio reco" apps go together. What sense modalities are we missing here? Remember--our goal in this is to increase the range of tools we know about that help us be more effective searchers. Are there more reco-based search tools that we're missing from this list? 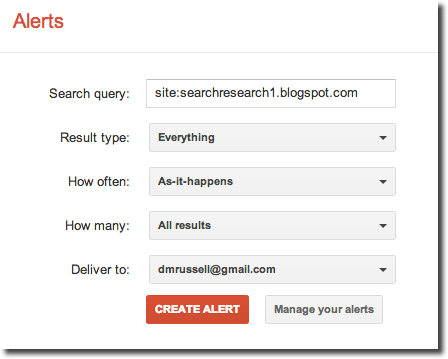 Search on (for more search tools...)! Google Goggles Runs augmented Image search of scene. LeafSnap Recognizes deciduous leaves of North American trees. LookTel Money; cans of food. Intended for low vision users to find everyday items. Evernote Part of Evernote does handwritten text recognition. Recognizes hand-written Chinese, Japanese, Arabic, etc. Picasa / iPhoto Recos faces from the set of faces you’ve tagged . WhatTheFont Identifies the font in which a given text is set in an image. IdMyPill Identifies pills by size,shape, color. their particular spot pattern. Open source project. Searches for images based on similarity to images on the net. eating everything on your plate. ArtCapture Recognizes "more than 500K" works of art based on cell camera image. Viggle Identifies TV show you’re watching by recognizing the sound track. TunePal Identify live performances of Irish Session tunes. John J Williams is widely regarded as the last casualty of the US Civil War. He was killed at the Battle of Palmito Ranch (Texas) on May 13, 1865. Civil War buffs will recognize that this was a full month after the sides reached an accord at the Appomattox courthouse in mid-April. It's clear that news about the end of the war spread slowly. Even though telegraphy was widely used, there were still many places that weren't "wired" to receive the news. Those gaps in coverage cost time (at least 1 month here), and ultimately, lives. This same thing still happens, though perhaps with lesser consequences these days. In my earlier post about the Capitoline Wolf, several people asked "So what did your daughter put on her test?" I finally got the answer: She put down that it was of Etruscan origin, even though she knows it's not. "Why did you put down something you know is wrong?" I asked. "Because I need the point on the test..." was her reply. That's a pragmatic answer, and I can't give her a hard time for wanting to do well on the test. Naturally, I think I would have objected and fought for the point. This is personally important because a similar thing happened to me when I was a high school sophomore, and it pretty directly led to my career as a research scientist. In my high school biology class, my teacher kept talking about the various causes of diseases--"there are millions of diseases caused by bacteria and viruses... and thousands of diseases caused by protozoa..."
I heard that and thought about all the diseases I could think of that were protozoan-caused. I thought of malaria, elephantiasis, sleeping sickness... and I couldn't think of any more. "Thousands?" Really? So I raised my hand and objected to the "thousands" characterization. In response, my teacher picked up a fat book (I believe it was the Merck Manual) and tossed it to me saying "Look it up!" I did. And discovered a few more diseases that I hadn't known about. But that took the number up to 12, not thousands. But it was that inspirational moment for a kid in school, and I worked for a few weeks on the question, visiting libraries, and ultimately writing to the head of the Microbiology department at UCLA. 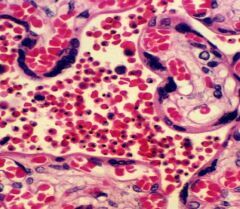 Graciously, and to my everlasting debt, a faculty member wrote back to me with a few photocopied pages from a textbook (I believe it was Human Parasitology), with a kind note saying that I was correct, there aren't that many protozoan-caused diseases. Here's the list: there are (at the time) around 20. That was a pivotal moment for me: I developed a life-long habit of probing deeply into the whys and hows of assumed information. Of course, since my time in high school (in the 1970s! ), it's become much simpler to do this kind of questioning of received knowledge. It's a habit I think we ALL need to take on--in both our roles as students (because we're all permanent students now), and as teachers (because we're also all teachers now). Which takes me back to the Capitoline Wolf problem. It's been known for a long time that the Capitoline Wolf isn't of Etruscan origin--but the books haven't been updated to reflect that. There's a long list of things we used to teach that are no longer considered to be true. Junk DNA is no longer "junk," Pluto is no longer a major planet, but now a "minor planet," the largest known prime number (currently 257885161-1, but certain to change soon), etc. I'm not expecting the textbook publishers to step up here, so it's really all of our jobs. Although it might be really useful to create a socially-generated site that updates "facts that have changed in your field" wiki. Anyone up for the challenge? And most of all I would love it if teachers would be actively modeling this for their students. Kids shouldn't have to give the "expected answer" when they know it's wrong. They should get extra credit for discovering an update to the course. And then we could feed this back into the publishers and help keep our students' materials up-to-date. What would you do? What knowledge do we teach that's woefully out of date? Answer: What does this character mean? Answer: Why is she wearing that kind of hat? Answer: What's the name of that song?